Finding someone to share your life with. Good friends who enjoy helping you out when you need it. Finding new skills and being able to use them. Finding a community that is big enough to survive and small enough to get to know everyone. Being able to share your joy in life with others. Finding a place where talent is encouraged and recognized. Being able to pause in the headlong pursuit of future goals and to realize that we have accomplished what we set out to do in many areas. 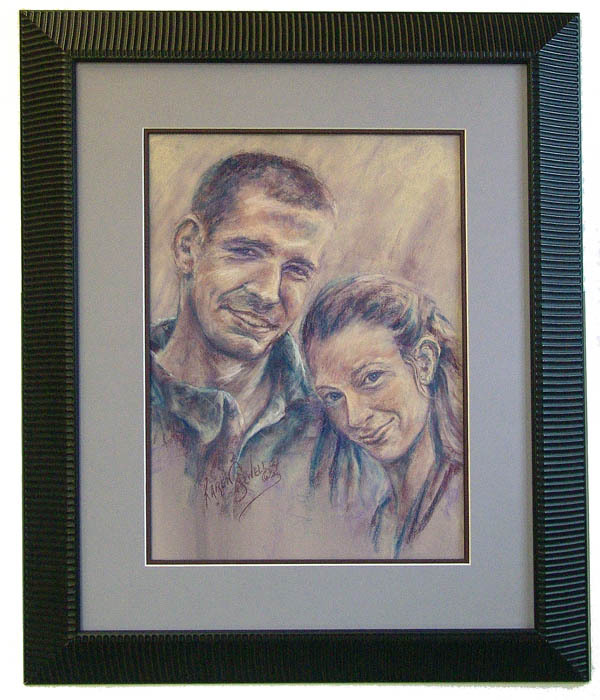 The pastel drawing of this charming young couple was created by Karen Sewell. I created the custom frame. It is absolutely incredible to be part of a community where this type of creative activity happens every day. I am very thankful for all of this and for the support and encouragement of my readers. I hope that all of you have things to be thankful for. This entry was posted in Simpler Lifestyle and tagged custom framing, Karen Sewell, pastel drawing, simpler lifestyle, Thanksgiving, things to be thankful for. Bookmark the permalink. This is a great list. Thanks. And by the way, is that photo of you a new one? I seem to recall you as being a bit heavier with a pony tail when I saw you at Taste of Floyd this year. I like this look! David responds: Thanks for the compliment! The heavier guy with the ponytail is someone else. I have never had a ponytail although I had shoulder length hair in the Seventies.